Captain David Kern earned a Bachelor of Science degree from the United States Naval Academy and was commissioned in May 1981. Upon completion of nuclear power training and Naval Submarine School, he reported to USS HONOLULU (SSN 718), homeported in Norfolk, Virginia. He supported deployed ships in the Mediterranean and served as Chemistry and Radiological Assistant and Communicator until the ship was delivered to the Pacific Fleet in 1986. CAPT Kern then reported to the Naval Postgraduate School at Monterey, California and earned a Master’s degree in national security affairs. CAPT Kern served as Combat Systems Officer on USS NEWPORT NEWS (SSN 750) and in 1990 received the Stephen Decatur Award for Operational Excellence from the United States Naval League. In 1990, he reported aboard USS CINCINNATI (SSN 693) as Engineer Officer and deployed to the North Atlantic. In 1992, CAPT Kern served as a junior member on the Nuclear Propulsion Examining Board on the staff of the Commander in Chief, U. S. Atlantic Fleet. CAPT Kern reported as Executive Officer on USS NEBRASKA (GOLD) (SSBN 739) in 1995 and conducted four strategic deterrent patrols. During his tour, NEBRASKA’s crew earned the Submarine Squadron TWENTY Battle “E” Award, the United States Strategic Command’s Omaha Trophy, and a Meritorious Unit Commendation. In 1997, CAPT Kern was assigned to the Chief of Naval Operations Staff in the Directorate for Submarine Warfare. In June 1999, CAPT Kern took command of USS SAN FRANCISCO (SSN 711), homeported in Pearl Harbor, Hawaii. Under his leadership, SAN FRANCISCO was awarded a Secretary of the Navy Letter of Commendation, two consecutive Fleet Golden Anchor Awards, and completed an Engineered Refueling Overhaul three months ahead of schedule. CAPT Kern is married to the former Pamela Kelley of Reston, Virginia. They have two children, Michael and Margaret. He has been awarded the Meritorious Service Medal (three awards), the Navy Commendation Medal (four awards), the Navy Achievement Medal, and various other unit awards. Born in Caribou, Maine and raised in Westfield Massachusetts. He enlisted in the Navy on the Delayed Entry Program March 4, 1977. Entered service May 31, 1977, after graduating with honors from Westfield Vocational High School, Westfield, MA. Attended Navy Basic Training in Great Lakes, IL and on to MM “A” School (1200-PSI Steam). His first assignment was onboard USS MULLINNIX (DD-944), homeported in Brooklyn Navy Yard, NYC undergoing overhaul. The ship changed homeports to Charleston, SC one month later and deployed to the Middle East/Persian Gulf area after post overhaul shakedown and certifications. In December of 1978, MMCM White attended Submarine School in Groton, CT with follow-on orders to USS BENJAMIN FRANKLIN (SSBN-640)(BLUE). He completed his tour and was honorably discharged from the Navy in May of 1981. After a brief period as a civilian worker in the Portsmouth Naval Ship Yard, Kittery, ME, he reenlisted in the Navy for 4 years in August 1981. He was reassigned to the USS BENJAMIN FRANKLIN (SSBN-640)(GOLD) and moved to Charleston, SC. After completing his sea tour, he went to shore duty at Naval Submarine Support Facility (NSSF) New London, in Groton CT, and was assigned to the Submarine Mast and Antenna Repair Team (MART/67H) in the Electronics Division. His next sea tour was aboard the USS DANIEL WEBSTER (SSBN-626)(GOLD) as the Leading Chief Petty Officer (LCPO) of Auxiliary Division. He was promoted to Senior Chief during this tour. Returned to shore duty at NSSF as LCPO of the Outside Machinery Division (R-9) and then to the Production Office as a Ship Superintendent. At the completion of this tour he attended the Senior Enlisted Academy (Class 57) in Newport, RI with follow-on orders to the USS ANNAPOLIS (SSN-760) as Chief of the Boat (COB) in July of 1993. He was selected for promotion to Master Chief Petty Officer and successfully completed his tour in August 1996. In September of 1996 he began his tour as Command Master Chief of NSSF and successfully completed this major command tour in April of 2000. 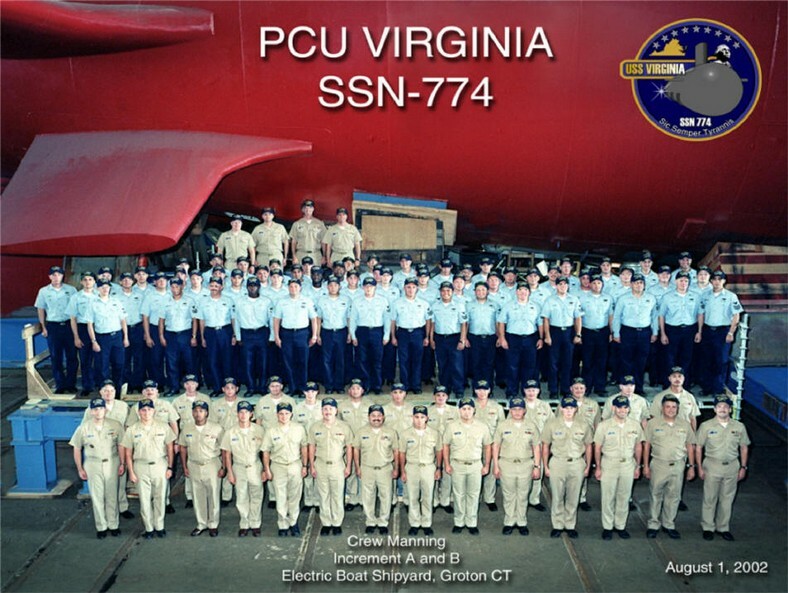 He competed and was selected for assignment to Pre Commissioning Unit VIRGINIA (SSN-774) as COB. His planned rotation date is May 2005. He is authorized to wear the Meritorious Service Medal, the Navy Commendation Medal (three awards) and the Navy Achievement Medal (four awards). He is married to the former Kari Seward of Kittery, Maine. They reside in Gales Ferry, CT with their two teenage children, Dustin and Heidi.